New Music, Listen Here First! 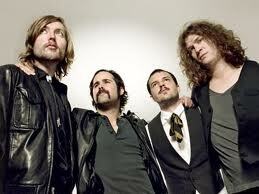 The Killers “Be Still” – music. travel. repeat. I am an unashamed lover of The Killers retro-feeling pop rock brand of music as you may know, so I was eager to hear their new album that just dropped, Battle Born. The good and bad news is that it sounds like a Killers album. For everyone that complains when a band they like goes in a new direction, there are also people like myself that would also like to see bands they like try something new to keep things fresh. What I got with their latest album was 16 more tracks that could have been on one of their last 3 albums. That said, I was drawn to this song, “Be Still”. I think The Killers have perfected the melancholy, heart twisting rock song and this is another good entry (think Dustland Fairytale). Give it a listen, I think it will be a hidden gem on the album. Let me know what you think too! Next Post Next post: If you like Amy Winehouse, you will love this song!